Thurston Engineering offers a complete line of industry leading digital and analog temperature and process control instruments. We can provide the solution for your controlling requirements from Solid State and Mercury Displacement Relays to highly customized control panels, hot runner controls, and power controllers. Contact our representatives to find the solution that is best for you. From hardware and software product development through testing, prototyping and production, our custom electronics modules are tailored to your exact specifications. Our products have recently undergone an extensive redesign to make them both visually and functionally distinctive. Each product comes with a performance guarantee and on-going technical support; including documentation. Our Modular Control Panels offer the "best of both worlds" allowing you to select as much or as little heat and/or cool control as you need. Our compact basic control board can accept plug-in boards so you can purchase the amount of capacity you need now plus have the ability to add to your system later as your needs grow. Let us show you how we can design a system for your most challenging control project. We offer a full line of controllers including Loop Controllers, Digital Controllers, Analog Controllers, and Series Limit Controllers. Our multi-loop PID offers up to four loops of PID control with cascade feed forward capabilities for less than four separate controllers with similar capabilities. 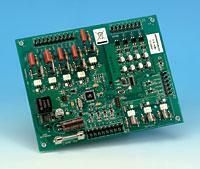 Digital controllers are designed for a wide range of diverse temperature and process control applications. Analog Controllers are designed for panel and subpanel PID temperature control, accurate proportional termperature control, differential (on/off) to proportional control and as superior electronic temperature controllers to replace bulb and capillary controllers.